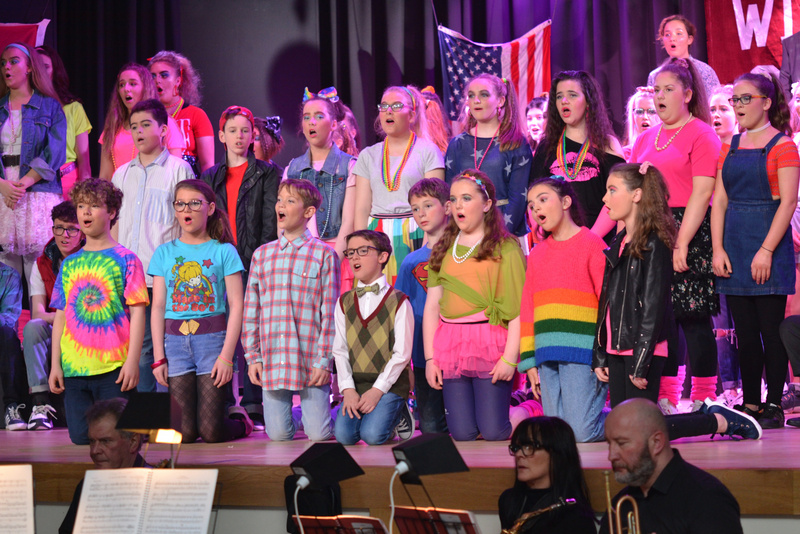 This year, Limavady Grammar School raised the roof of their assembly hall with four foot-stomping performances of ‘Back to the ‘80s!’, and the audiences loved every minute! 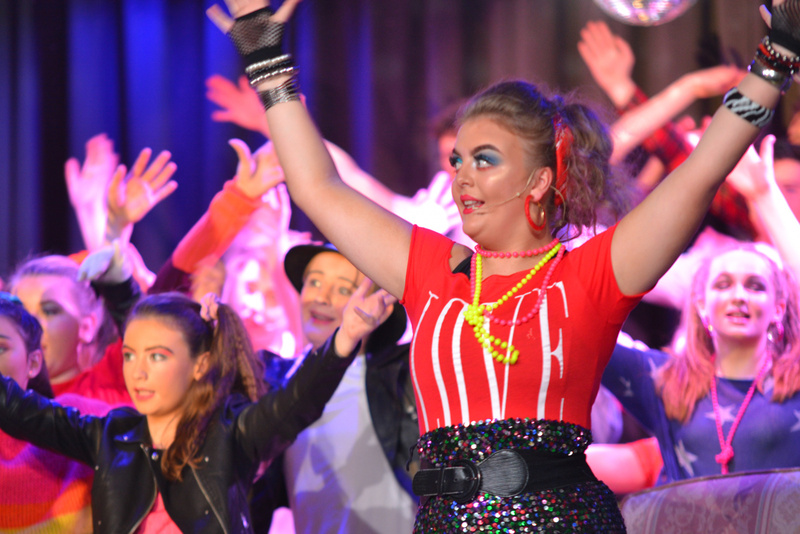 Under the original and experienced direction of Miss Claire Gordon, the professional guidance and instruction of Musical Director Dr Derek Collins, and the skilful choreography of Miss Zoe Kyte, the show entertained, wowed and touched many hearts and minds: young people and adults alike. The show opened with Kain Breydin as Corey Palmer Senior in the present, reflecting on his final year at school back in the mid-1980s. Through a tender and measured portrayal, Kain was instantly likeable as the rather shy and humble Cory Senior, and gained our sympathy as he delved back into the angst and awkwardness of his teenage years, and invited us to join him on his journey of reflection. 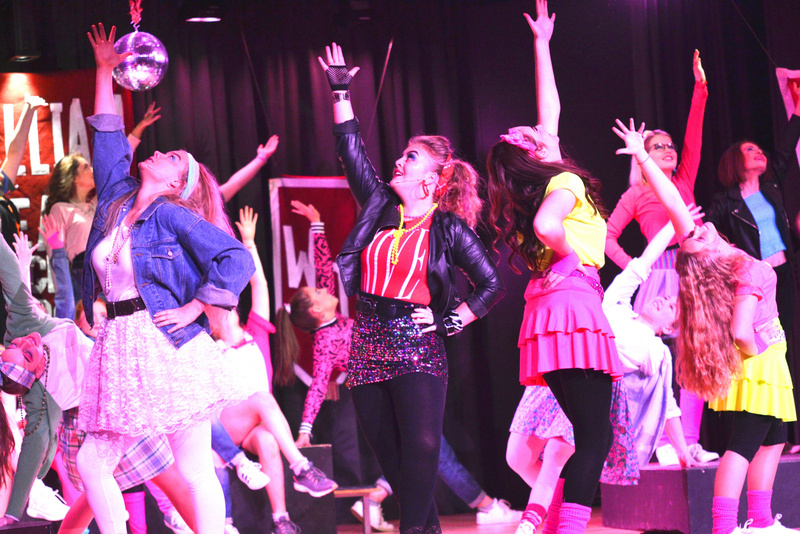 Almost immediately the stage was an array of neon attire, crimped hair and vintage ‘80s fashion, as the entire company filled the auditorium with a highly energetic (and very colourful) rendition of Kim Wilde’s ‘Kids in America’. 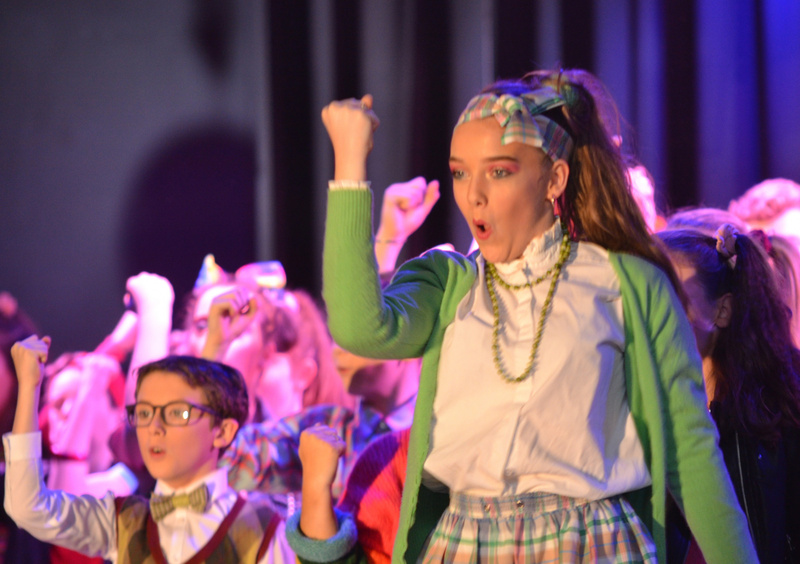 The cast’s energy was not limited to their vocals….as both principals and chorus members alike, delighted and dazzled with their polished, perfected choreography. Talk about setting the tone! We were simply left wanting more. Malachy Kitson played the role of Cory Junior with talent beyond his years, His awkward, stumbling, shy character won the hearts of his audience. We followed him on his journey to impress and ultimately win the heart of the ‘girl-next-door’ Tiffany Houston (Sephy Weavers). Cory was supported and encouraged throughout by his loyal friends Alf Bueller and Kirk Keaton (Dara Collins and Daniel Devenney respectively). 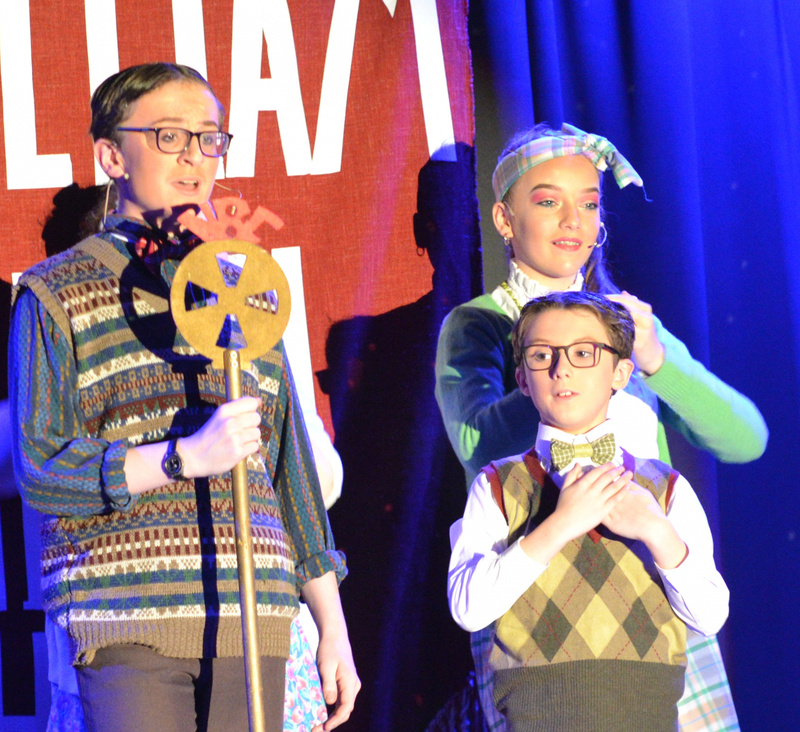 The warmth of these three characters (and their splendid talent) was evidenced when they succeeded in cheering up a rather wounded Eileen (Anna McElhinney) through their ‘Barber shop’ style trio performance of ‘Don’t worry; be Happy’. 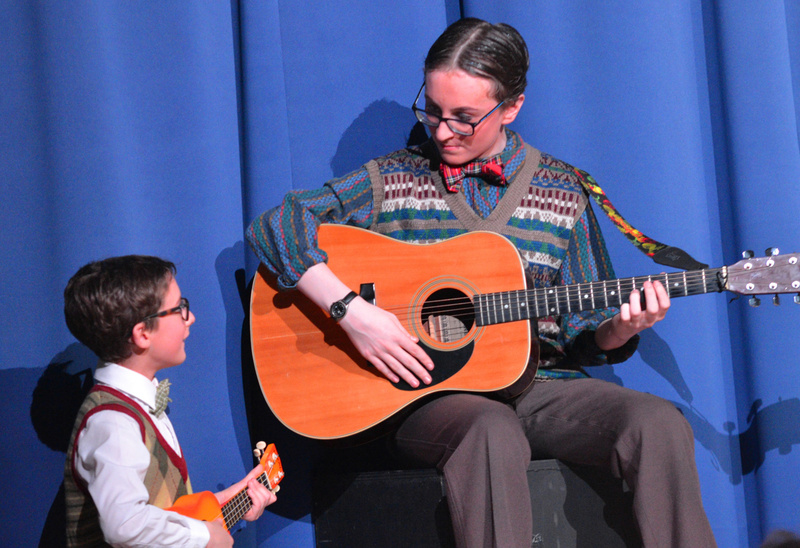 With only a gentle accompaniment, this number showcased the boys’ raw musical talent, in a potentially vulnerable situation. A brave, bold move boys, and one which you nailed! 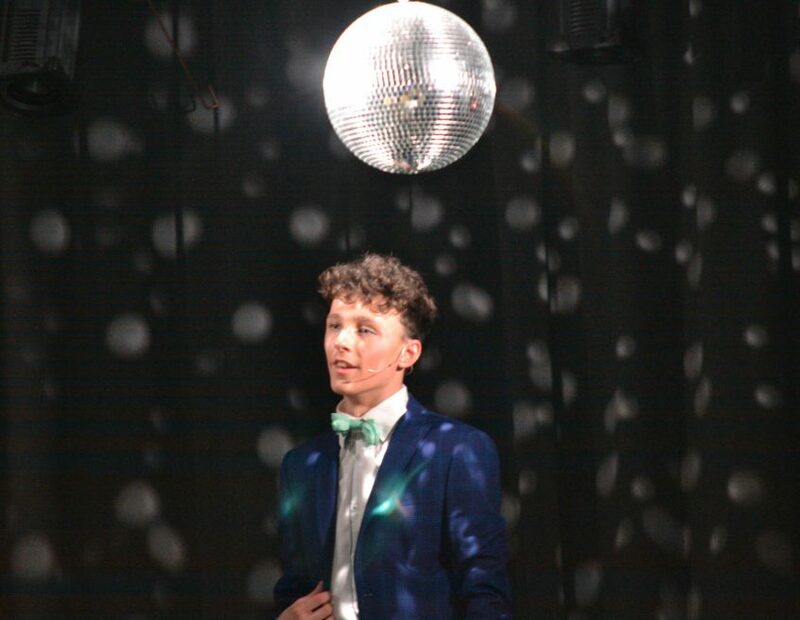 Kitson’s moving performance of ‘The Glory of Love’ was exceptional: his strong vocal talent was clearly evident, along with his skill in maintaining the emotion of the song. The costume, lighting and props teams succeeded in making this a memorable scene, as Cory’s ‘Star Wars’ dream sequence came to life right in front of our eyes, complete with cameos from Darth Vader, Yoda, and lightsabers! 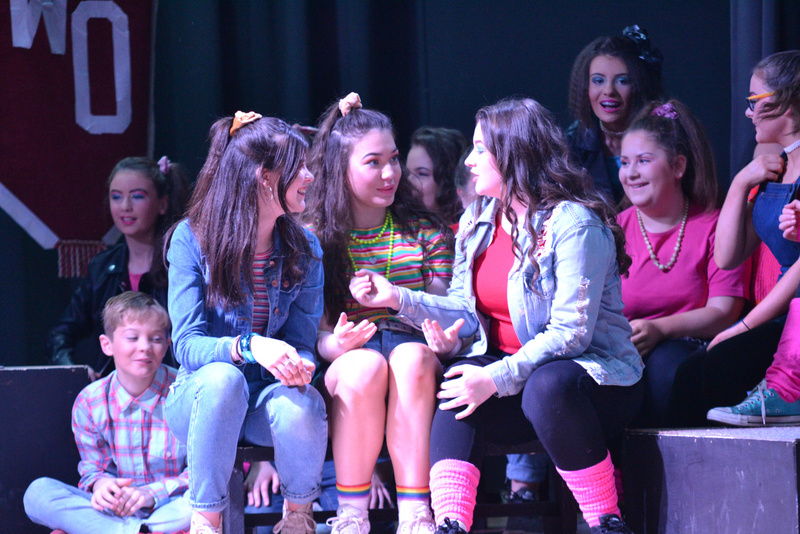 Tiffany Houston (the object of Cory’s affections) and her best friends (Cyndi, Mel and Kim –Hannah Deane, Lily Mullan and Jessica Morgan) were introduced to us in the early stages of the show as girls, simply wanting to ‘have fun’. 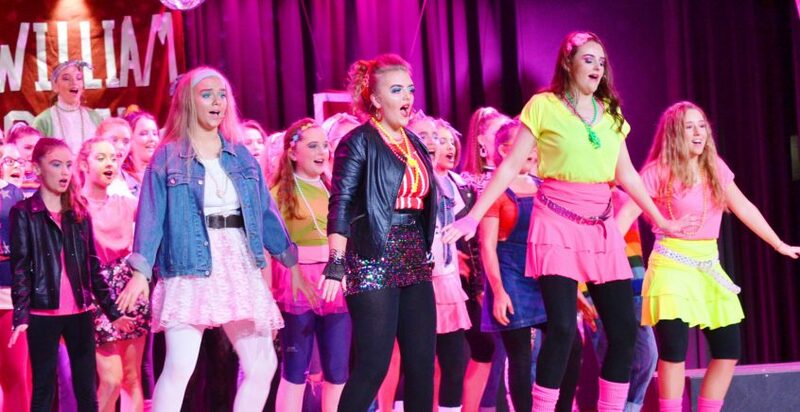 They were the proverbial ray of sunshine on stage as they performed Cyndi Lauper’s timeless ‘Girls Just Want to Have Fun’, much to the delight of their male counterparts. 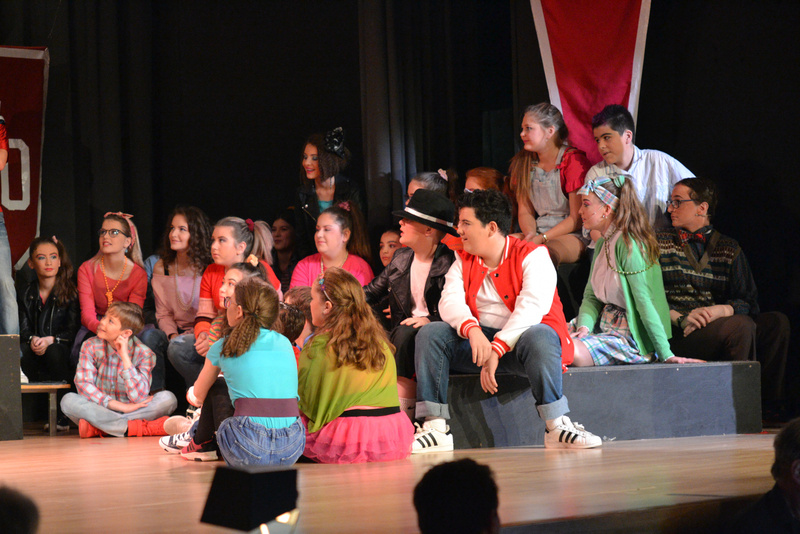 With a superlative routine and vocal expertise, this was a pitch perfect performance, and a slick visual treat!! The girls’ performance was quickly mirrored and matched by the principal boys’ highly energetic ‘Footloose.’ Led by sports jock Michael Feldman (Conor Sanchez), his best friends Billy Arnold, Huey Jackson and Lionel Astley (Andrew Armstrong, Shay Campbell and Adam McElhinney) dazzled us with their punchy routine and strong vocals. We were most impressed boys! Conor Sanchez was utterly convincing in his role as Cory’s nemesis, the arrogant, smug and yet widely popular Michael Feldman. His arrogance was epitomised as Tiffany, Cyndi, Mel and Kim. adorned him during their vivacious and vibrant cheerleader performance of ‘Hey Mickey’. Feldman clearly revelled in the attention! Conor’s skills as an actor were tested and most definitely proven throughout the whole production as he sang, danced, and even rapped (most ably supported by the beat box champ – Andrew Armstrong!) his way through his scenes, all with ease and absolute skill. 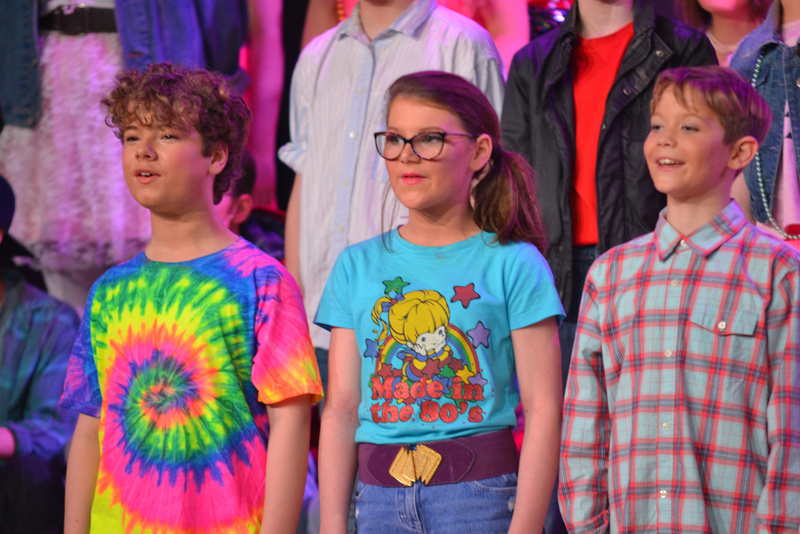 As the lead vocalist in several musical numbers, it appears that there is little this young man cannot do – watch this space…..! A true talent, and an absolute joy to watch on stage! Undoubtedly one of the most lovable characters in the entire show was Feargal McFerrin – the hugely intelligent and socially shunned, school-geek. 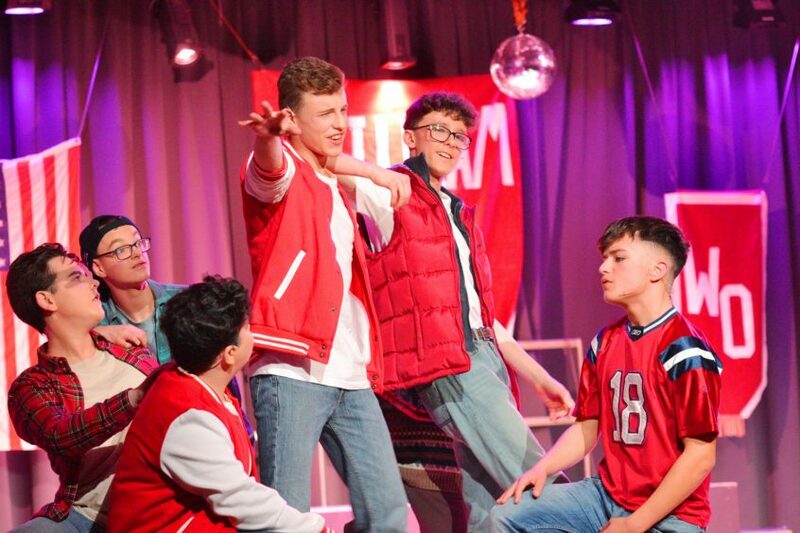 This lovable character was brought to life by the very talented Niall, McCallion, who captured Fergal’s insecurities and idiosyncrasies perfectly. 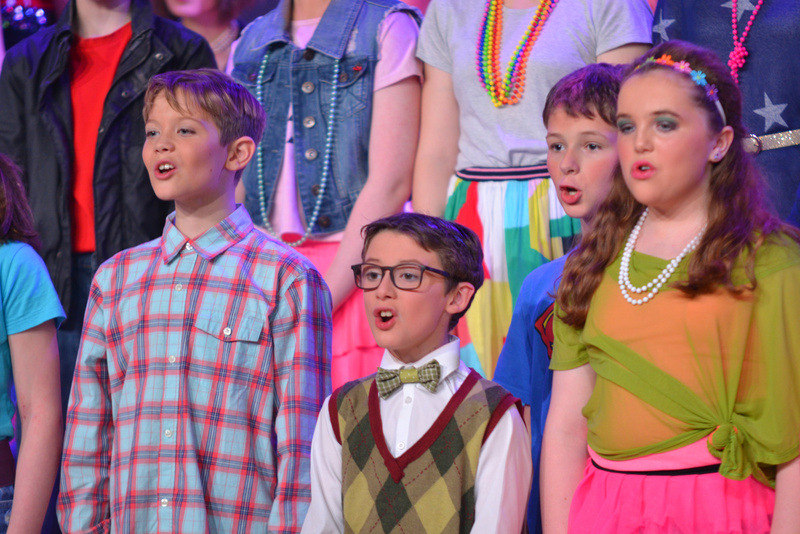 ‘Video killed the Radio Star’ was a huge hit amongst the audience: Niall had the whole audience in the palm of his hands. What made his portrayal of Fergal even more endearing was his right hand man, his ‘mini-me’ – Joshua Hunt. With his loveable character and infectious smile, Joshua won all of us over. 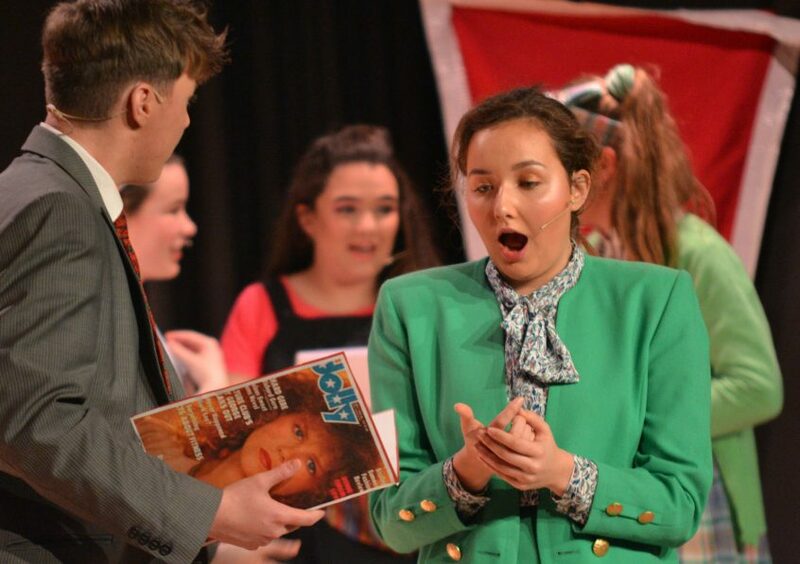 Not to be outdone by her on-stage, on/off partner, Naomi McCracken (in the role of conservative English teacher Miss Brannigan) provided an equally polished and perfected performance. She and Jamie led the whole company to the mighty and highly charged chorus. Naomi’s natural talent was evident, both musically and dramatically. This was an unforgettable performance and – without doubt – my favourite of the entire show! A spectacular vocal and visual treat! 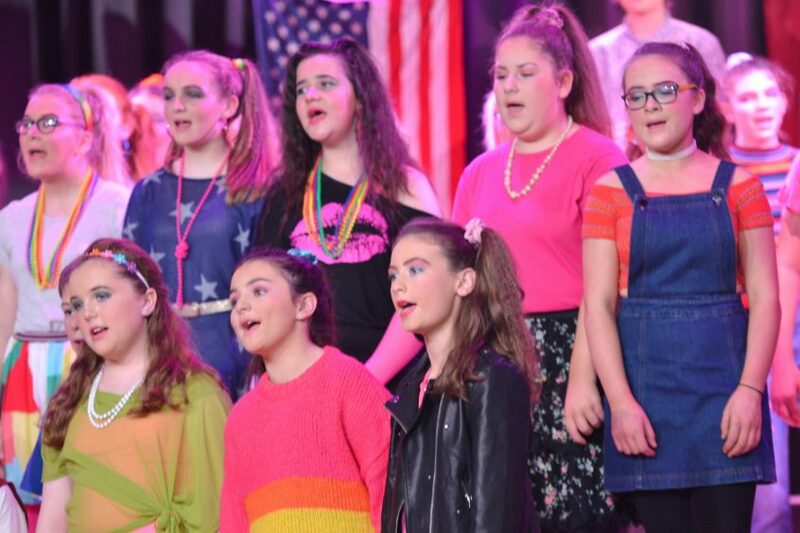 The wholesome characters of Eileen Reagan, Laura Wilde and Debbie Fox (charmingly staged by Anna McElhinney, Bethan Gilpin and Hollie Deane) wowed the audience in the second half with the highly energetic ‘Walking on Sunshine’. Their complicated yet compelling performance coupled with note perfect vocals proved their utter skill…. and stamina! 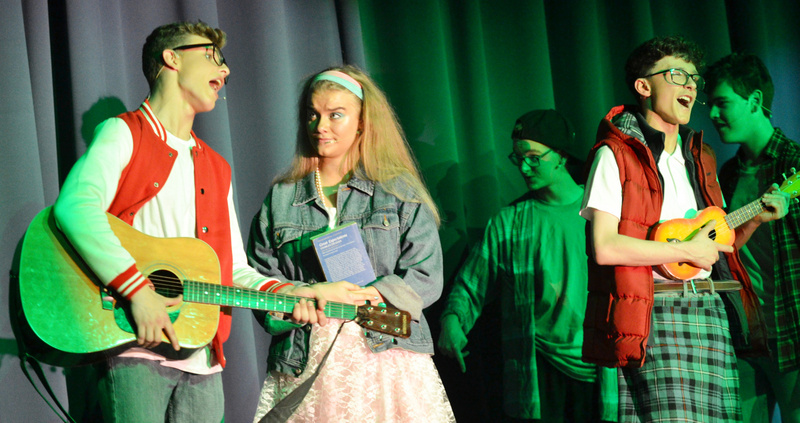 A definite feel good performance which had the desired uplifting effect upon everyone in house. 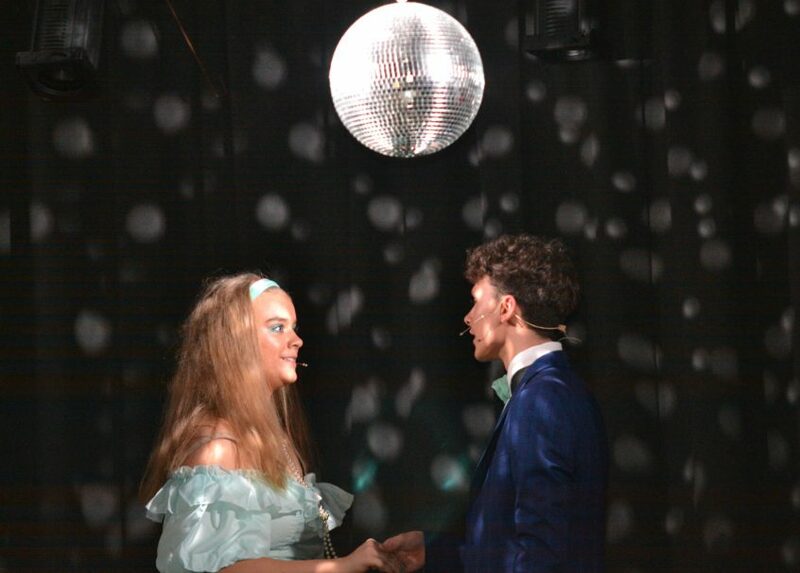 Naomi and Malachy’s version of Bonnie Tyler’s ‘Total Eclipse of the Heart’ was another musical masterpiece. While both belted out this ballad, they balanced their performances with aptly timed delicacy and emotion so that we could both hear and see the stabbing pain of heartbreak! An Oscar-winning performance guys – we loved it! 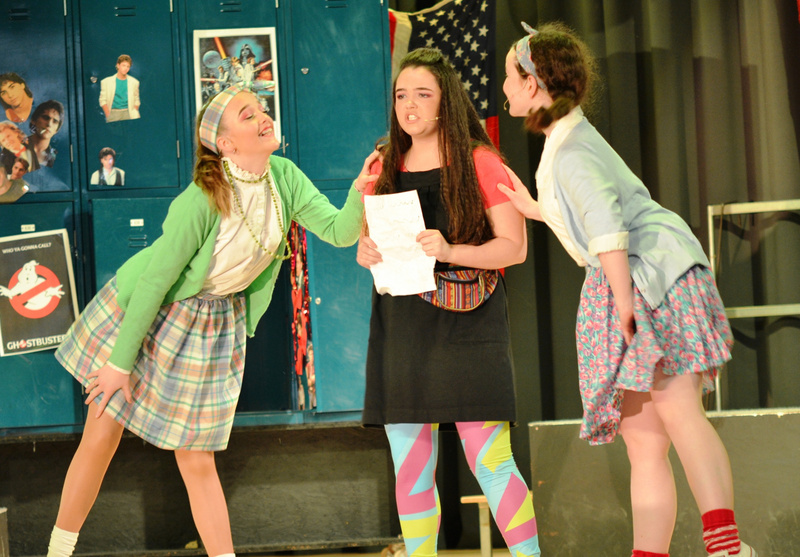 One of the most sensitive moments of the show was Tiffany and Eileen’s rendition of Debbie Gibson’s ‘Lost in your eyes’. Anna McElhinney’s rich voice was complimented perfectly by Sephy’s, producing a beautiful final result. 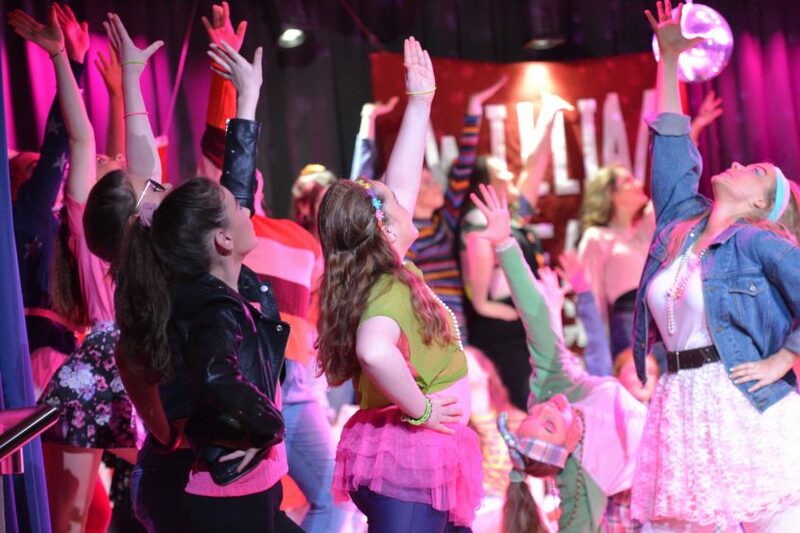 Goosebumps all round ladies – well done! Adorned with furs and jewels, Hannah Deane gave a cracking performance of Madonna’s iconic ‘Material Girl’. She merged beautifully accurate vocals with elaborate and rather feisty choreography. Absolutely iconic entertainment Hannah – we loved it! 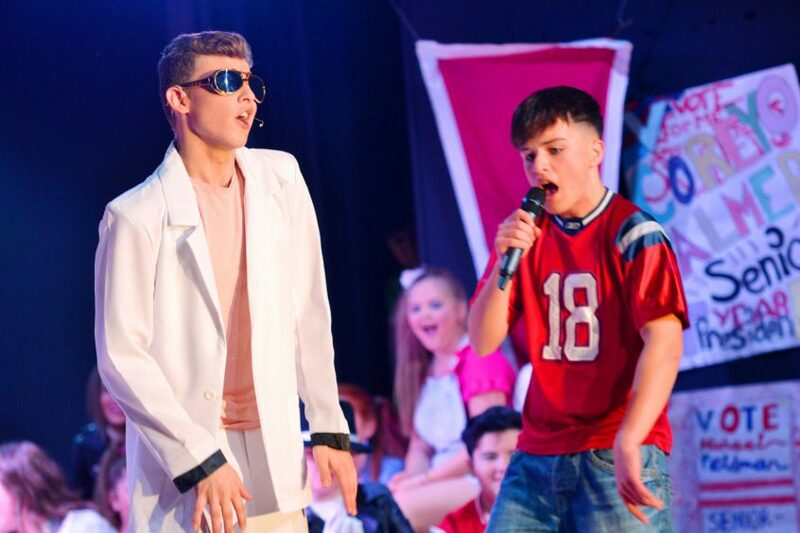 It’s fair to say that no ‘80s show would be complete without paying homage to the King of the ‘80s himself– Michael Jackson, and boy, did Shay Campbell pay such devotion through his character of Huey Jackson! Armed with the signature white glove and dance moves, Shay entertained one and all in an effective and endearing portrayal! 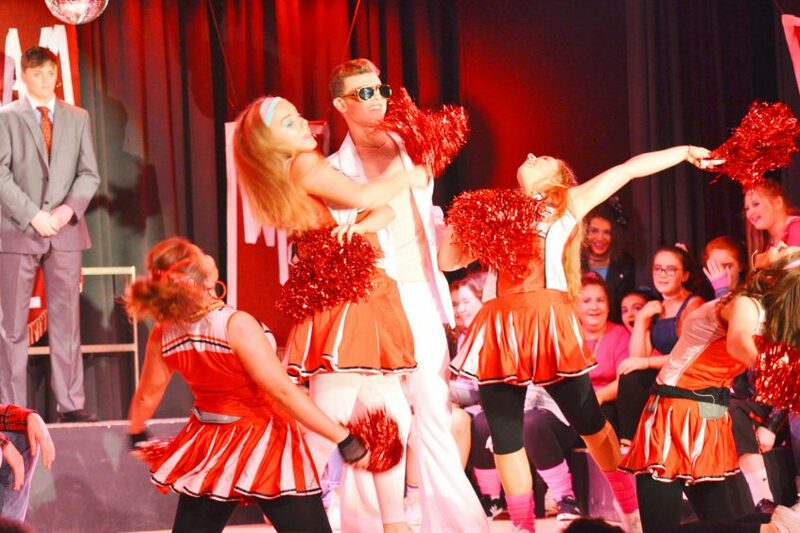 Like all good things though, this stellar show had to come to an end, and what better way than with Dirty Dancing’s ‘The Time of my Life’? 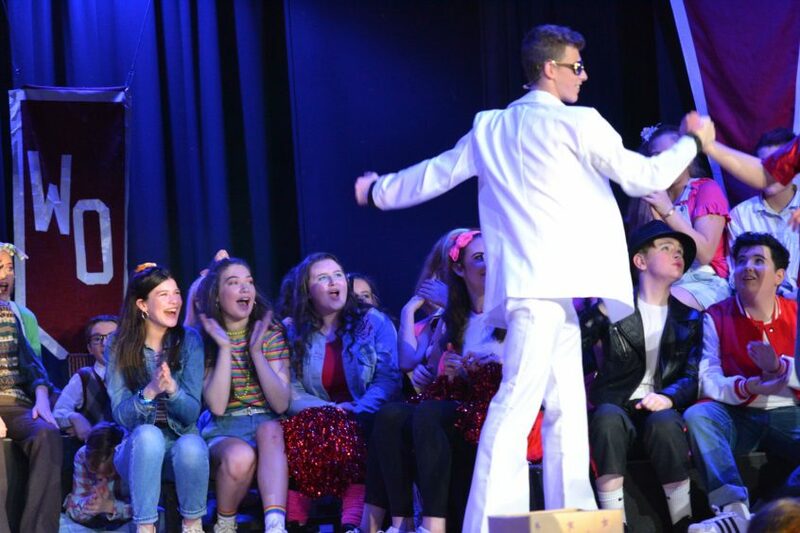 After a final spine-tingling duet from Sephy and Malachy, the stage was flooded with music and emotion, with the entire cast delivering a powerhouse performance. 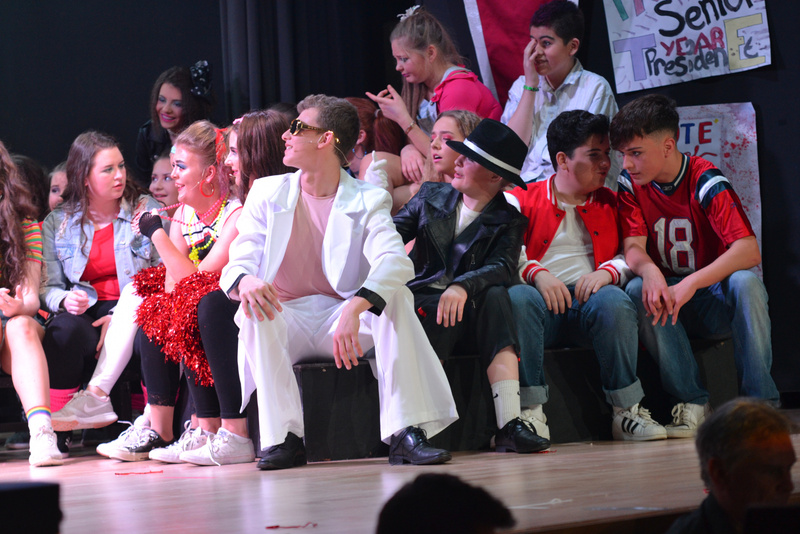 It was clear that every single pupil was having the time of their life, and that this moment would be forever etched on their memories. Corey Senior’s closing words, if I am totally honest, brought a tear to my eye; bringing home the realisation that what you expect at 17 does not always materialise. What you hope for at a young age may not actually be what’s for you – and that’s not a bad thing! Limavady Grammar – you certainly did not disappoint! We all left feeling uplifted and joyous; no mean feat in these uncertain times. 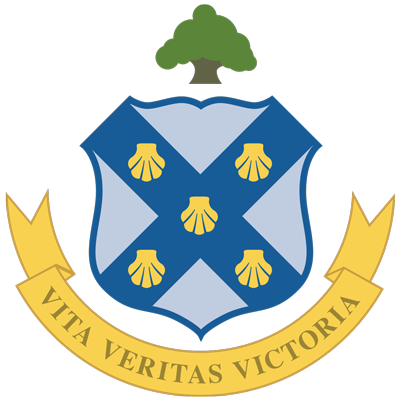 Bravo, one and all – and here’s to the next!